I’m not Cantonese, but my grandmothers on both sides are, so I would like to think I grew up with a deep appreciation of Cantonese cuisine. 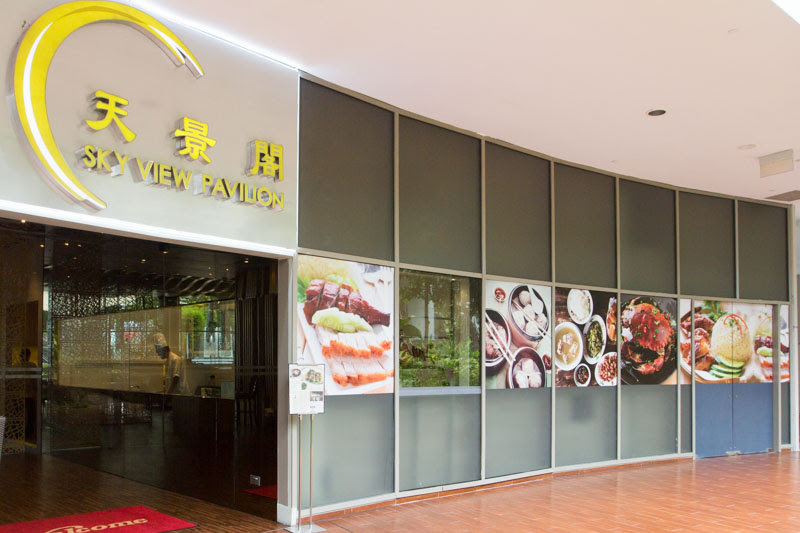 When I heard that Sky View Pavilion at the Singapore Flyer was newly refurbished in January 2017, and I was certainly excited to try their take on Cantonese dishes. 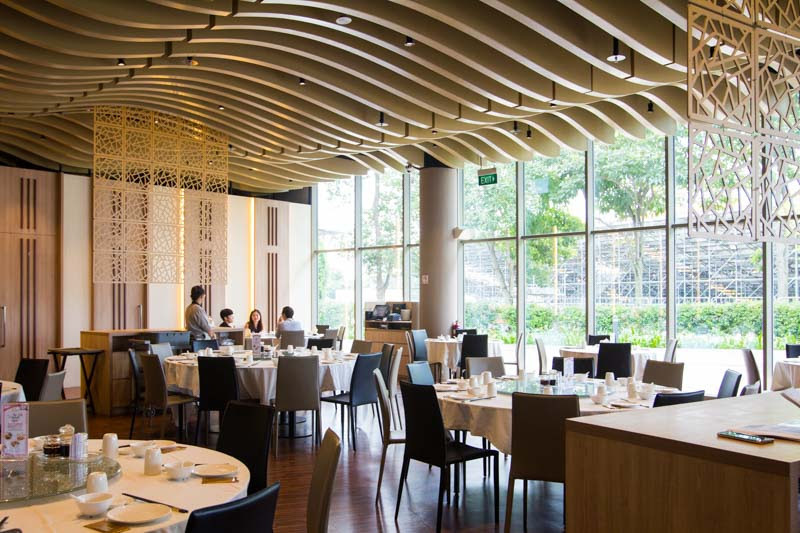 Located at the first floor of the Singapore Flyer building, the elegant interior of the restaurant is bathed in plenty of natural light during the day thanks to the floor-to-ceiling windows, coupled with plenty of wood accents and warm lighting. Starting off with the Stir-fried Superior Shark’s Fin with Crab Meat & Dried Halibut served in Superior Soup ($58 per person), I was slightly surprised when the dish was served dry with the soup on the side. 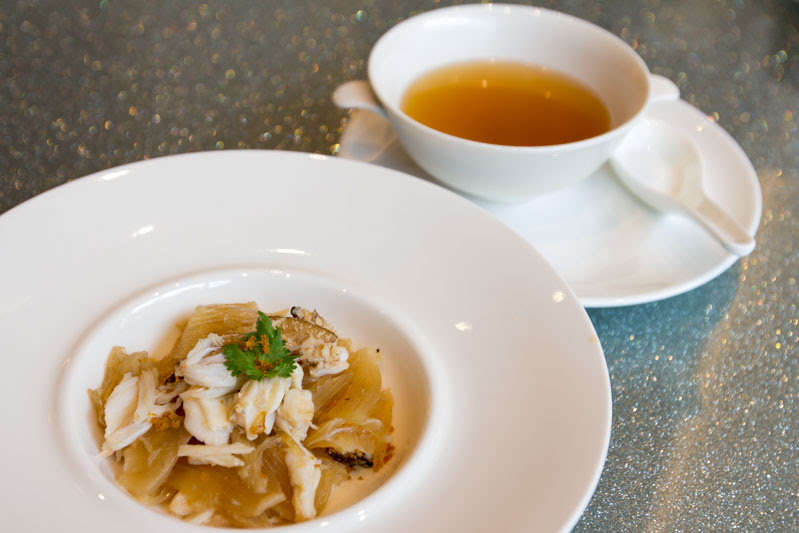 I was instructed to eat the shark fin without mixing it with the broth first, and interestingly, the shark fin was stir fried with crab meat, and bits of dried halibut that added a nice briny taste. The soup was very rich and a little on the salty side, but was balanced out when paired with the dry ingredients after. I usually like to have steamed fish, but the Pan Fried Sea Perch Fillets ($15) were the star of the meal and I polished off my plate within a matter of minutes. The crisp exterior contrasted against the moist and tender fish inside, and the thick, sweet sauce just added to the richness of the dish. The fish fillet was fresh, with a clean and sweet taste that went along well with the sauce. The Sauteed Beef Cubes with Black Pepper & Capsicums ($30) was a little on the pricey side, but I’d let that slide since the cubes were perfectly cooked to medium-rare. 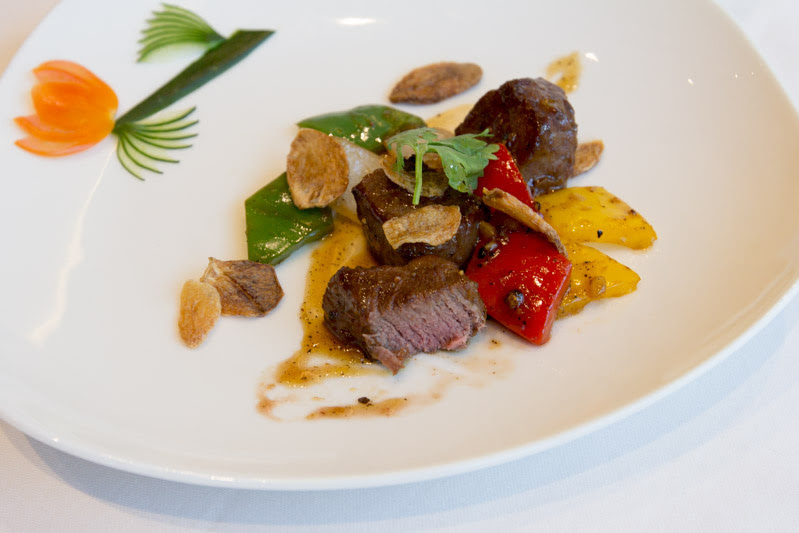 The black pepper sauce certainly gave the dish a peppery kick, while managing not to overwhelm the flavour of the beef, and the capsicum added a nice crunch and freshness. 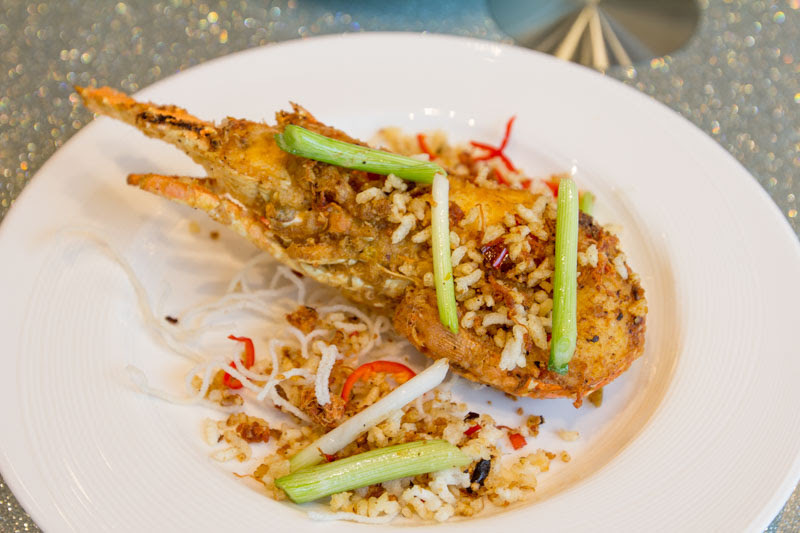 I love seafood, so I was super excited to try the Live Baby Lobster Baked with Black Bean, Crispy Rice, Minced Garlic & Cut Chilli (Seasonal price). The crispy rice was light and airy with a bit of char, and I enjoyed them so much that I separated the bits of chilli just so I could get to all the crispy rice bits. I managed to get the lobster flesh out without any of it sticking to the shell, proving that the crustacean was fresh and well-cooked. The dish also had fermented black beans that gave it a nice earthy taste. Finishing off with dessert, I had the Double Boiled Hashima Served in Coconut ($16). This certainly isn’t a dessert for people who are squeamish, because hashima comes from fatty tissue near the fallopian tubes found in frogs. Hashima is relatively tasteless, taking on the sweet flavour of the soup that it’s cooked in, and consumed mostly for its gelatinous texture and health benefits. 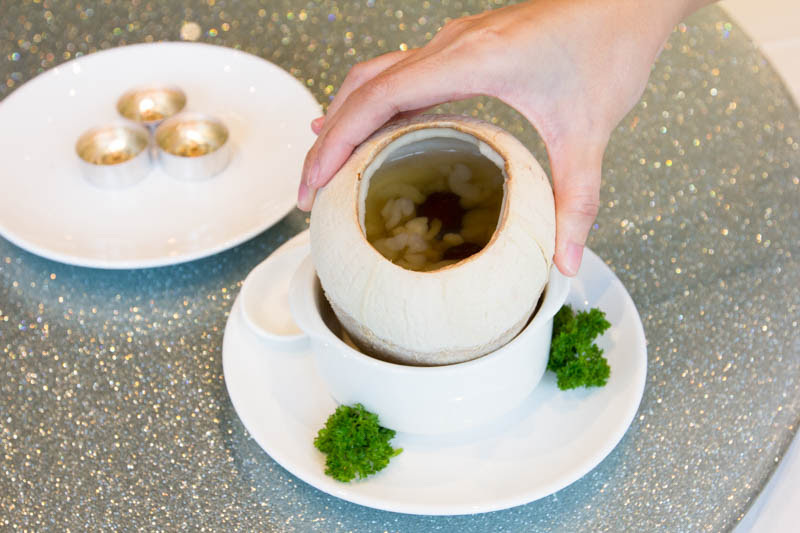 The soup was sweet, with a strong taste of coconut and red date, which was a light dessert to end the meal with. 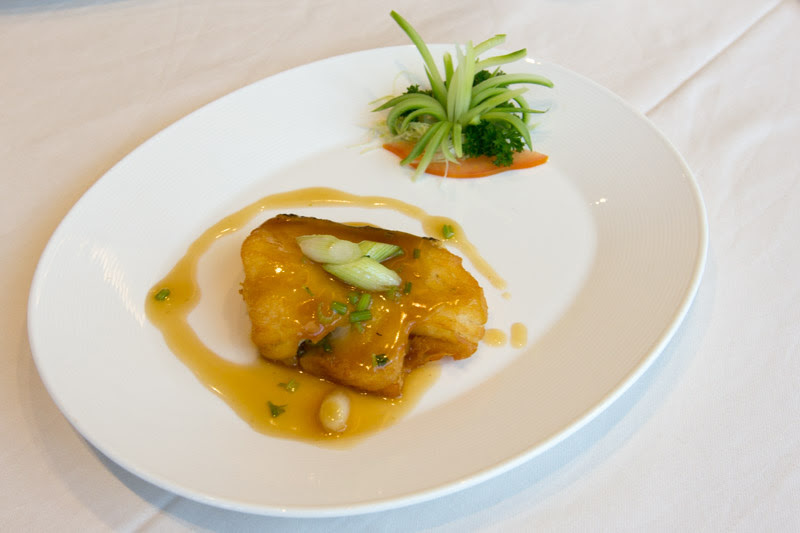 Overall, I thought that the menu at Sky View Pavilion had a pretty diverse range of dishes that make up Cantonese cuisine, and certain dishes including the Pan Fried Sea Perch Fillets, definitely stood out because its was absolutely delicious.